The Student's Pack is ideal for self-study. It consists of the Student's Book with Answers with CD-ROM and the Audio CDs which contain all the material for the listening activities. The Student's Book with Answers contains 8 topic-based units with stimulating activities to ensure that students gain skills practice for each of the four papers of the IELTS exam. 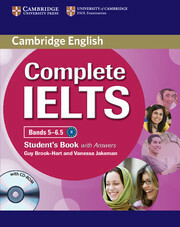 It also contains a complete IELTS practice test to allow students to familiarise themselves with the format of the exam. The CD-ROM contains additional skills, grammar, vocabulary and listening exercises.